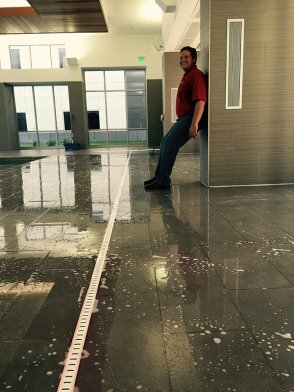 Showcase Floors strives to provide the highest quality of service to every customer. mission to leave the customer 100% satisfied with our work. 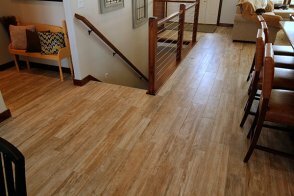 Features: Engineered hardwood allows for increased structural strength while maintaining the overall aesthetic of a solid wood product. 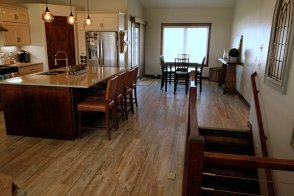 This floor features artisan hand scraping and staining for character and dramatic graining. Features: Natural stone with beautiful variations define this walk in shower. 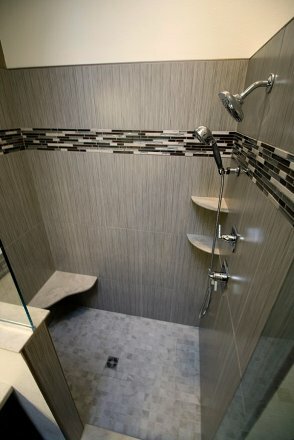 Utilizing both mosaic and 3 x 6 tiles adds interesting depth, while dual shower heads make for a divine shower experience. 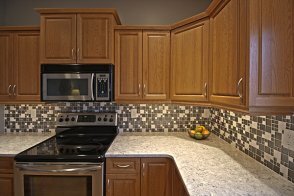 Features: Timeless subway tiled backsplash with classic cabinetry molding creates focus on the details and brings a classic yet artistic vibe. 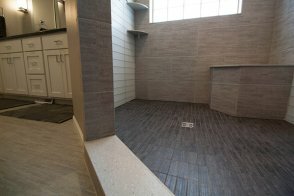 Features: A garage shower for your furry friend. 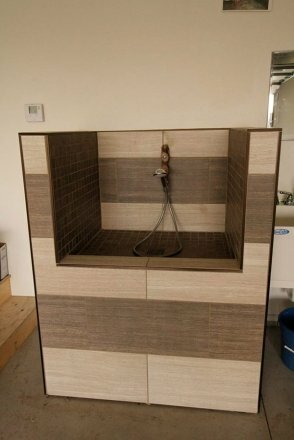 An elevated custom made dog bathing area saves your back and pampers your pet. Features: Stunning minimalist appearance with a modern twist. 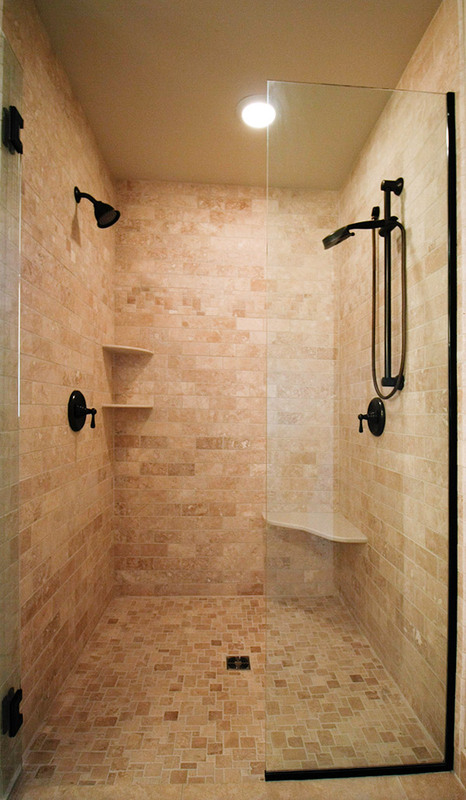 Custom elements turn this walk-in shower into a blissful retreat. 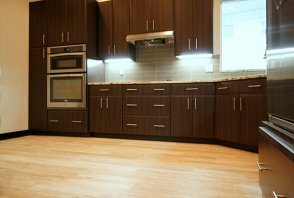 Features: Hardwood flooring designed to showcase the natural richness and purity of the varied wood species. Features: A half wall topped with glass can make the most of a compact space. Horizontal mosaic adds texture and dimension. A small corner bench provides utility without crowding. 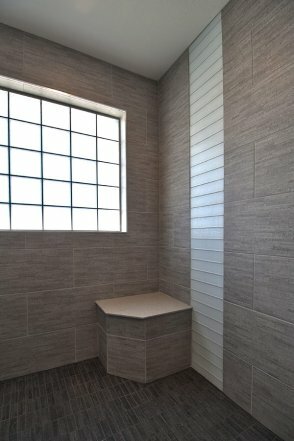 Product: Walls - Cole, Metropolis Mocha (Straight Set Vertical); Deco Band - Cole, Stone and Brick series; Floor – Catalina, Overcast 2 x 2 mosaic. 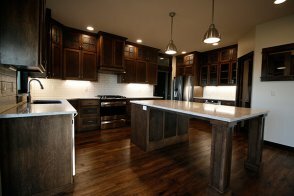 Features: Feeling of a traditional kitchen but with the clean, simple lines and materials of a more contemporary design. 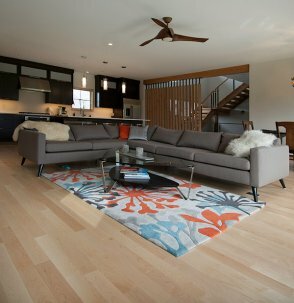 Transitional design allows the homeowner to put their spin on each piece, blending elements for a custom result. Features: Offers the visual charm of time-worn, reclaimed hardwood with the durability and performance of porcelain. Creates a nostalgic feeling reminiscent of hand-cut wood planks. Features: Drawing attention to a specific area focuses attention toward design elements used to define a space. Here a large corner fireplace is used as the star; beauty and functionality meet for a comfortable living room. 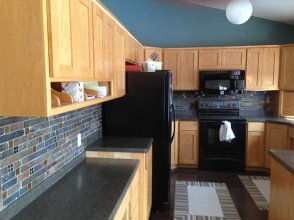 Features: Simple cabinetry with deep brown flat panels with a complementary backsplash provide a warm and inviting space in this cozy apartment kitchen. 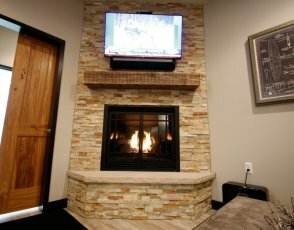 Features: Ultimate texture and style makes this fireplace pop without needing to oversell color. 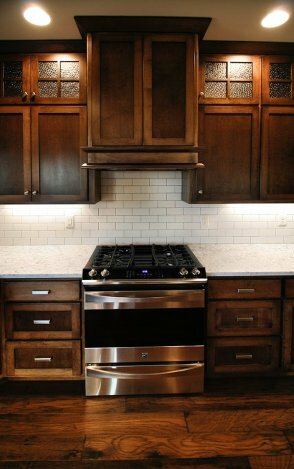 Features: This stone and glass backsplash plays perfectly with wall color and wood floors. Natural elements with a designer flair. Features: Application of an invisible anti-slip tread for safe walkways in wet conditions. 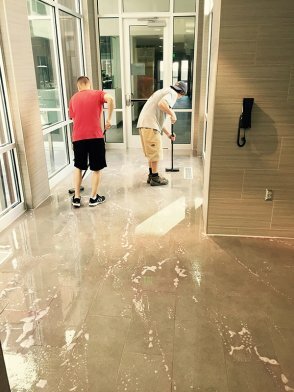 Can use floors immediately after treatment. 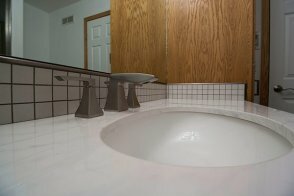 Features: Long lasting treatment will not change the appearance of floors or bathtubs. 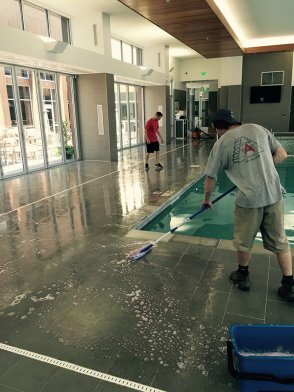 Safe for use on concrete, tile, terrazzo, glazed brick, marble, and porcelain. Features: Perfect for both residential and commercial applications where slipping and falling is a concern. 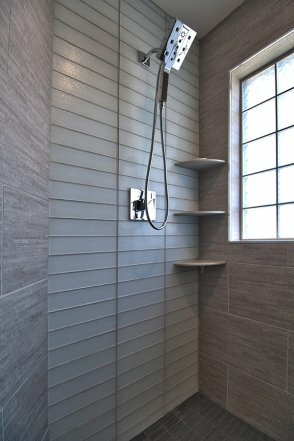 Features: A darker shower floor highlights the textured wall and breaks up the light grey tile used throughout the bathroom. Features: Remodeling this small bathroom space resulted in a beautiful contemporary area. Product: Mixture of mosaic and field tiles. 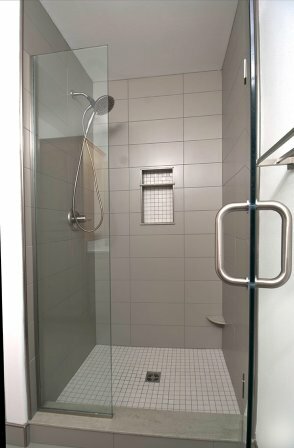 Features: Using a straight lay pattern for the shower walls and bathroom floor emphasize contemporary feel. 2x2 white mosaics brilliantly offset the taupe tiles in the backsplash and shower floor to create dimension and personality. 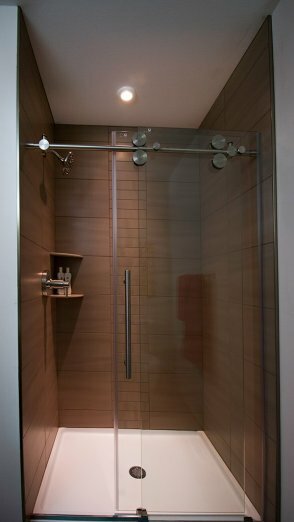 Features: A glass door in a smaller remodeled space can make the shower and bathroom feel more open and larger. 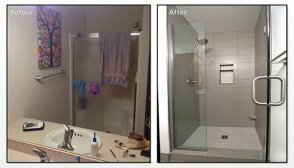 Product: 2 piece front glass shower door. 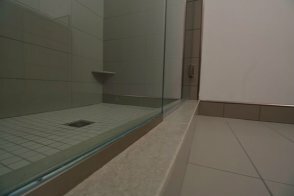 Features: Light grey contemporary tiles beautifully accentuated with textured tile; a Corian corner bench designed for both utility and ease of cleaning; and a glass block window to allow natural light into the shower. 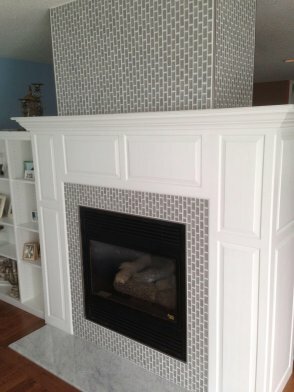 Features: The frosty mosaic accent wall brings texture while 3 Corian shelves add functionality.